Prof. (Dr.) Sohan Raj Tater as Former Vice chancellor, Singhania University, Rajasthan has been nominated by Central Government in Central Advisory Board for promoting Yoga at National level as well as at International level. 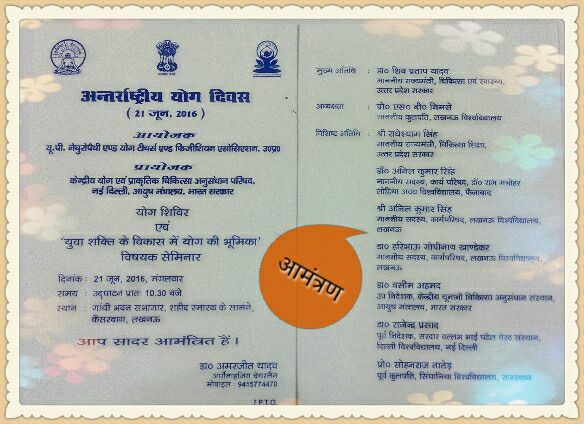 In this Context he will preside as Distinguished Guest (Invitation attached) in Central Programme organized by Ministry of Ayush Department, Govt. of India on 21-6-16, International Yoga Day at Mahatma Gandhi Sabhagar, Lucknow (U.P.) and will specially boost Up all ages of persons to adopt Yoga in their Daily Routine.